1963 was the last year of production by GALE. 1957-8 6N-HR Class BU Hot Rod not rated. Model and serial number guides. Click on the following links for the major brands. For minor brands see the listings below. Gale was a division of OMC, parent company of Johnson Evinrude. As a result the motors were very similar and sometimes identical. Gale motors were called Buccaneer. For a time in the 1950's, Gale was the world's largest producer of outboard motors. Chris-Craft had a short but interesting history. Production of this popular motor ended in 1954. Commodore motors were made by West Bend for 3 years. I'm not sure if it was a private label or just a West Bend designation. Comanco has a confusing history. It is related to Milburn Cub, Continental, Commando and Husky. In 1948 Scott-Atwater began producing a line of private label outboards for the Corsair Motor Co. Of Minneapolis, MN. The outboards were distributed by both Skelly Oil Co. and Pure Oil Co. The line was dropped in 1957. Elgin motors were sold by Sears from 1946 to 1963. The early ones were made by West Bend until 1959. These have a 571 model designation. After 1959 they were made by Scott, and have a 574 model designation. After 1963 they were called Sears, Ted Williams or Gamefisher. ESKA sold its first outboard in 1960. Eska took a single cylinder air cooled engine made by Tecumseh and attached it to a Clinton lower unit. It was about as simple as could be. They continued unchanged until 1973 when Eska introduced a water cooled two cylinder 9.9 and 15 HP motor. They went out of business in 1987. Eska supplied motors to many retailers such as Sears, Pennys, Grants and others. Clinton made a line of simple, aircooled motors from 1955 to 1982. They were known as lightweight, dependable motors. The models and model numbers remain basically unchanged until production is discontinued in 1987. The years are determined by serial numbers, which is too cumbersome to print here. If you need more information, call. A good source for parts for Eska products is Certified Parts Corp. at 1-800-356-0777. 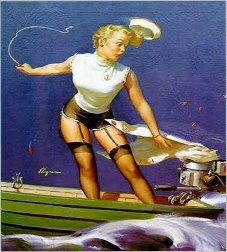 In 1941 Gambles Department Store began selling Hiawatha outboard motors. These were a private label motor made by OMC's Gale division. Beginning in 1956 they were made by Scott and discontinued after 1961. Lauson motors were made starting in 1940 as a 4 cycle air cooled motor. After the war they came out with a 6 HP motor with a gearshift. They contemplated a larger radial design motor in the 1950's but dropped the idea. In 1956 Lauson sold out to Tecumseh. Majestic first appeared in 1950 and were made by Champion. They were referred to as "The King of Outboard Motors", and disappeared from the scene in 1958 along with Champion. A short lived production of a high quality and innovative motor. Still has a large following. The McCulloch Corporation acquired Scott-Atwater in 1958 and kept the Scott name until 1963, after which they were called Mcculloch until production ceased in the late 1960's. See our HISTORY page for the story of Robert McCulloch. 1961, 1962, 1963 Year is designated by first two digits of serial number. 1964, 1965 model year is designated by the first two digits of the serial number. MUNCIE got their start in the 1930's, but we will begin with the post war models. Motors not manufactured in 1952-1953. After that the only model made was the 1.7 HP. This continued into the 1990's with the Mighty Mite 2 HP. This motor bore a striking resemblence to the Johnson Evinrude 2 HP, and could be purchased as a complete motor, or as a kit, where you assemble it yourself. OLIVER replaced the Chris Craft, and the 5.5,6HP and 15, 16HP we very similar to their predecessor. For later models see Mcculloch. Sea King motors were sold by Montgomery Wards. They were made by Gale from 1946 through 1963. Starting in 1964 they were made by Chrysler, and continued up until Chrysler got out of the outboard business in 1984, although some were sold in 1985. In the 1970's a few were made by Clinton. All the Chrysler Sea Kings had model numbers starting with VWB. The Clinton Sea Kings usually had a K or an X in the model numbers, and said made by Clinton. The Chrysler Sea Kings are still easy to get parts for, The Clinton Sea Kings are somewhat difficult. Starting in 1964 Sea King was made by Chrysler. In 1970 Sears motors consisted of some leftover McCullochs, and Eskas. 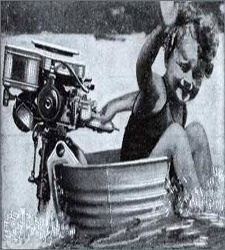 West Bend took over the assets of Kissel Motor Car Company in the 1930's, who were making Waterwitch outboard motors for Sears. After the war, West Bend continued to make motors for Sears, which were sold under the name Elgin. These were totally re-designed motors and sold very well while the major makers were still selling pre-war designs. In the mid 1950's West Bend decided to sell a line of their own outboards. Purchased by Chrysler Corp in January 1965. See Chrysler for following years. Early Wizard motors were sold by Western Auto and made by Mercury. An unusual little motor, they were made from 1947 to 57. Came in a single cylinder 2.5 HP and a 5 HP 2 cylinder. They remained basicly unchanged over the years and model and serial numbers are inconclusive.